Discipline honed as football player and cadet at Army West Point laid the groundwork for a remarkable military career. Cadet Robert Caslen’s typical day at Army West Point started before sunrise. At 5:30 a.m., he and his peers rose to tackle chores and get in formation outside. By 7 a.m., after breakfast, they headed to class. From 4 p.m. until about 6:30, all cadets then participated in some form of athletic activity — whether it was their Division I sport or a club or intramural team. For Caslen, a member of the school’s football team, that time was reserved for rigorous practice. By 7:30 p.m., cadets returned to the mess hall, ate dinner, and began study time in the barracks or the library. Then, it was in bed by 11:30 p.m. — with the knowledge that tomorrow’s wake-up call would come only six short hours later. Rigorous days like those are what forged Caslen, who graduated from Army West Point in 1975, into a man who would go on to a decorated four-decade career in the U.S. Army — a man who would help lead the nation’s response to terrorist attacks and eventually would return to the military academy to help mold a new generation of leaders. “West Point is designed to teach you leadership, so you can lead America’s sons and daughters in the crucible of ground combat,” Caslen said. “When reflecting on my four years at West Point and being put in those crucible experiences, and then being able to persevere and overcome, and be victorious, those were the leadership lessons that … have stayed with me in my 43-year career. The Army veteran, who retired last year, was hired recently by UCF to lead change in the university’s administration and finance operations. He still remembers his first football practice as a freshman. He had played both sides of the ball in high school in Vermont, and he was being considered by Army as either a center on offense or a middle linebacker on defense. On his first offensive play, he moved into a gap to take on the fullback, who was blocking for the halfback. Caslen took the hardest hit he had ever experienced. “When I got that helmet right between my chest that knocked me flat down, I thought, ‘OK. I got it. This is the new level I have to rise to,’” Caslen said. He was humbled when his parents surprised him by attending his first freshman collegiate football game, but he was so far down the depth chart that he hadn’t even dressed that Saturday. He committed to working his way up the roster. By the next week, he had earned a spot on the second-string offense, playing on the freshman team and also the scout team in practice where he squared off against the defense’s top players. At center, Caslen was small for his position, weighing 210 pounds while most of his contemporaries checked in around 250. Caslen may have always been the lightest guy on the line, but he became the team’s starting center for two seasons. More importantly, he was awarded the role of team captain. “Playing football prepared me for my job in the Army more than anything else I did,” Caslen said. The morning of Sept. 11, 2001, after the first plane hit the World Trade Center, Caslen was glued to the television in his office at the Pentagon, where he worked as an assistant deputy director of strategic planning and policy. After he watched the second plane hit, he turned to the dozen people crowded in his office and predicted the next target would be a military control center. Just 34 minutes after the second impact, a plane crashed into the Pentagon — only two sides over from his office. The building was immediately evacuated, but Caslen and some of his colleagues snuck back in to assist with relief efforts. They turned off the oil in deep fryers in kitchens and snack stands throughout the building, which were beginning to burn as they stood unattended. The group helped other staff evacuate smoke-filled hallways, and helped pull the injured to safety. Then, Caslen helped to set up a control center to establish communications with the White House. “I remember standing in the parking lot and saying, ‘Life as we know it is going to change.’ I thought this was the new norm, the new threat, something we would have to learn to live with and experience,” he said. By March, already having been deployed to other nations several times before, the Army sent Caslen to serve in the resultant war in Afghanistan, where he helped develop strategy and lead efforts on the ground. In 2008, he was deployed to northern Iraq. There, Caslen’s division lost nearly 60 men during his deployment — 1st Lt. Daniel Hyde, a former Army West Point cadet from Modesto, California, was among them. Caslen remembers him as one of the top cadets in the entire corps and a dear friend. They met when Caslen was a commandant at Army West Point. Hyde had wanted to join his division. Caslen returned to his alma mater in 2013 to serve as Army West Point’s superintendent. His experiences in football and combat shaped the philosophy that guided how he approached the job. He worked to instill a culture built on rising above mediocrity and adversity in order to win — and to win with honor. “As the superintendent, and this is what I learned on the football field, it was my responsibility to develop an ethos, a set of principles, within the corps cadets so they understood what it was to perform with excellence in everything that they do,” he said. Caslen, who retired in June, revered his cadets and they reciprocated. He laughed when asked about his nickname, “Supe Daddy,” which the cadets bestowed upon him during his time there. It’s a term of endearment, he said, given because he loved them and respected them, while also demanding they remain disciplined. 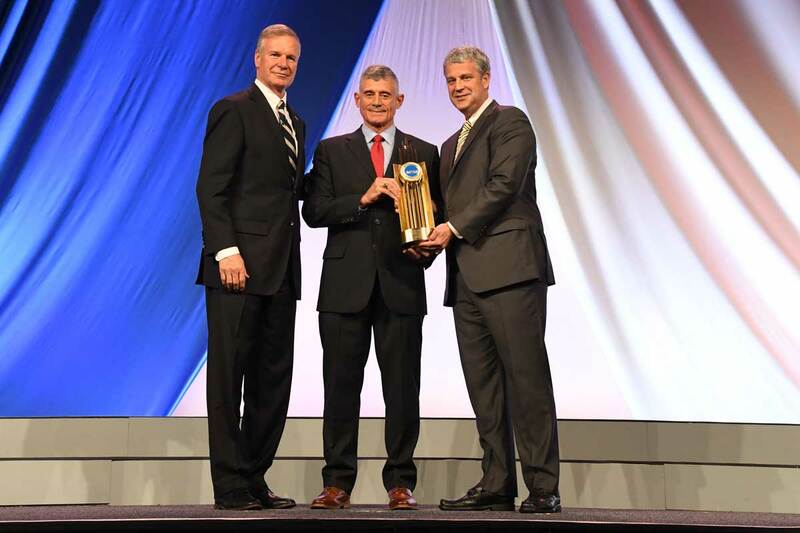 Retired Lt. Gen. Robert L. Caslen Jr. accepted the NCAA’s highest honor, the Theodore Roosevelt Award, Jan. 23 during the NCAA Honors Celebration in Orlando, Florida. The award, which is given annually to an individual who exemplifies the ideals of college sports, is named after the former president whose concern for the conduct of college athletics led to the formation of the NCAA in 1906.